Looking inside the human body without resorting to highly invasive surgery is the work of Radiologic Technologists and Technicians. 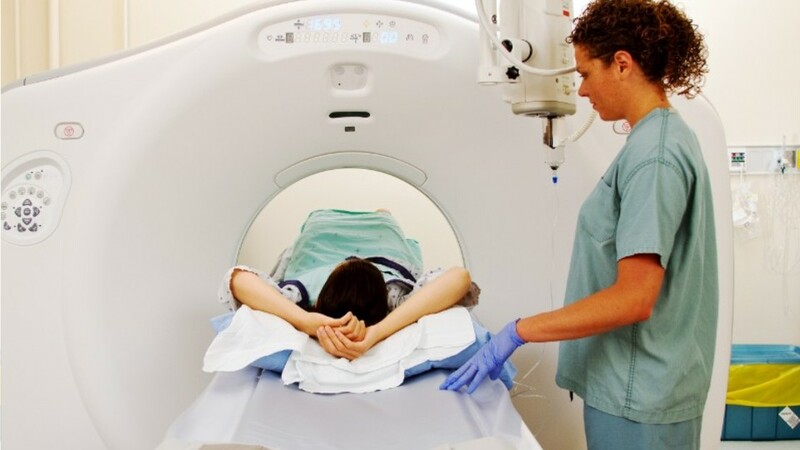 They perform X-rays, CAT scans and other imaging examinations, to help doctors develop accurate diagnoses. The technician positions the patient to get the clearest possible image results, before activating their equipment. Helping patients feel calm and explaining the procedure is part of the job. For certain procedures, they administer non-radioactive materials into a patient’s bloodstream. Technicians also monitor the video display of the area being scanned, adjusting controls to improve picture quality. Technologists may also perform imaging examinations, but in addition, they have the skills to evaluate the quality of the image. They are responsible for handling infectious and radioactive materials, and ensuring that safety measures meet government regulations. They may oversee radiologic staff, assigning duties and supervising the work, and help the facility’s administration develop operating budgets and make new equipment purchases. Radiologic technologists and technicians work in hospitals, doctor’s offices or clinics and laboratories. Typically, an associate’s degree in the field is required, and in most states, they must also earn a license or professional certification to practice. A certification can strengthen employment prospects significantly, even if the state does not require it. Radiologic Technologists by U.S. Department of Labor, Employment and Training Administration is licensed under a Creative Commons Attribution 4.0 International License.